Where did duckweeds come from? Duckweeds are flowering plants, closely related to the aroid family. Duckweeds are flowering plants (angiosperms). Duckweeds may appear to be very simple plants, but looks can be deceptive. The characteristics of their flowers, including the organization of their ovaries, the presence of double-fertilization, the structure of their seeds and other characteristics show that they are flowering plants. To see much of the evidence, you will need a magnifying glass, or, better, a microscope. Seeds, contain both an embryo and an endosperm. The embryo, the portion from which a new plant will develop, has a single embryo leaf. The single embryo leaf makes duckweeds members of the monocots, along with the lilies, the grasses, and the aroids. Considering the anatomical organization of their flowers and seeds allows botanists to classify duckweeds as close relatives of the arum or aroid family (Araceae). This family also includes many decorative house plants and flowers, such as the Philodendron, the calla lily, and jack-in-the-pulpit. The aroids and the duckweeds (Lemnaceae) together form the Order Arales. Pistia, closest living relative of the duckweeds? International Aroid Society, a comprehensive discussion with many close-up photos and diagrams. Drawings of the Pistia Flower, Embryo and Seed, from The Families of Flowering Plants by L. Watson and M. J. Dallwitz. Hesse Michael, University of Vienna, Austria, detailed botanical discussion of the differences between duckweeds and Pistia. Above: Drawing of Limnobiophyllum scutatum, a fossil duckweed discovered in Canada, courtesy of R.A. Stockey. The scale bar is 2 cm. Kvacek, Z. (1995) Aquatic Botany 50(1):49-62. "Limnobiophyllum Krassilov includes fossil free-floating stoloniferous plants each with one or two sessile suborbicular to reniform leaves of different size as well as numerous simple and one or two longer branched roots on a reduced main stem. The venation consists of campylodromous curved primaries, up to 14 in number, among which irregular reticulate veins of higher orders can be preserved. There are no signs of lateral pouches characteristic of the Lemnaceae. However, aerenchyma and pigment cells are well developed in Limnobiophyllum. Two species are recognized - Limnobiophyllum scutatum (Dawson) Krassilov (latest Cretaceous to Oligocene of western North America and Palaeocene of East Asia) and Limnobiophyllum expansum (Heer) Kvacek, comb. n. (Miocene of Europe). Turion-like bodies are associated with L. scutatum. No fruits have been found in connection, but numerous isolated ribbed seeds are associated with L. expansum. They resemble some Araceae and also Lemna L. and Spirodela Schleid. Such seeds are known as Lemnospernum Nikitin from the Tertiary of Eurasia. Limnobiophyllum resembles in some respects Spirodela, but it is larger and the roots and the habit are more like young plants of Pistia L. (Araceae). It differs from Hydromystria Mey. (i.e. Limnobium Rich.) by venation, root system and habit; the Lemnaceae, although similar, differ by lateral pouches of leafy fronds and the lack of branched roots and higher-order veins. Limnobiophyllum is considered as an extinct link related to Pistia (Araceae), from which Spirodela (Lemnaceae) may have evolved by reduction." Above: Photo of a fossil of Limnobiophyllum, courtesy of R.A. Stockey. This is a transverse section of a rosette plant with at least two leaves. The largest leaf cannot be seen in this section. There are many roots extending from the base. The scale bar is 5 mm. This fossil was collected by Stockey et al. at the Joffre Bridge area in the south-central Alberta, Canada. RA Stockey, GL Hoffman and GW Rothwell, (1997) American Journal of Botany, Vol 84: 355-368. "More than 200 specimens of Limnobiophyllum scutatum (Dawson) Krassilov have been recovered from lacustrine claystones in the Paleocene Paskapoo Formation near Red Deer, Alberta. The plant was a floating, aquatic angiosperm with helically arranged, ovate leaves attached in small rosettes. Rosettes are interconnected by stolons and bear simple adventitious roots as well as larger branching roots that appear to have vascular tissue. Leaves are pubescent, aerenchymatous, with 12-14 campylodromous primary veins that curve toward the apex, joining a fimbrial vein, often an apical notch. Staminate flowers with two, four-loculate stamens, are borne in the axils of second leaves. Anthers contain monoporate, globose, echinate pollen, 20-25 µm in diameter. The pollen wall is 0.8 µm thick, with a homogeneous foot layer, granular to slightly columellate infratectal layer and an echinate tectum. Pollen most closely resembles the sporae dispersae genus Pandaniidites Elsik. 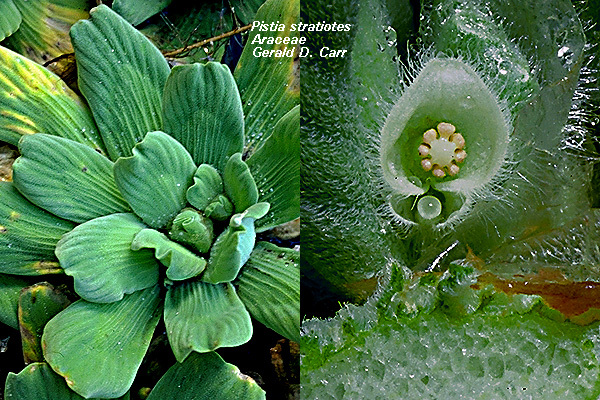 The completeness of L. scutatum has allowed for its inclusion in a numerical cladistic analysis to resolve relationships among taxa of the Lemnaceae, Pistia, and selected genera of Araceae. Results of the analysis indicate that the Lemnaceae plus Pistia form a monophyletic group within the Araceae." Limnobiophyllum resembled the duckweed family in their aerenchyma (air pockets), seeds, and flowers. However, they lacked the pouch from which new fronds emerge in modern duckweeds. Evolutionary relationships in the duckweeds and their relatives. DNA sequencing has been used to clarify the evolutionary relationships of duckweeds and other Araceae. The chart below, adapted from the paper of Cabrera et al., shows that the duckweeds evolved independently from water lettuce (Pistia). Similar results were obtained by Rothwell et al. Landoltia: A new genus of duckweeds? "Concerning the new genus Landoltia I only can comment that from a purely morphological point of view it was not necessary to create a new genus. The only species ("punctata") is morphologically between Lemna and Spirodela. It has some more characters together with Spirodela. However, if you look at the results of DNA and enzymatic investigations, it derived from Spirodela together with the other members of Lemnaceae and developed then parallel to the phylum Lemna - Wolffiella - Wolffia. Therefore, if you intend to form phylogenetically consistent taxa you have to separate S. punctata from the other two Spirodela species in a genus of its own." Some other experts remain skeptical and would keep it in the genus Spirodela. [ link to discussion of Les and Crawford - scroll down ]. However, further research using DNA sequences and other characters (Les et al., 2002) confirms this organization. More information and photos of Landoltia (Spirodela) punctata. Eldred Corner, Prof. of Botany, Cambridge University, UK: Evolution in Contemporary Botanical Thought (Chicago: Quadrangle Books, 1961, p.97. In context, this quotation refers to the limited plant species found in the temperate zone. Prof. Corner was a tropical plant expert, and he intended to mean that to find the "missing links" between the major evolutionary groups of higher plants, one must study the transitional plants which are to be found mainly (in most cases, exclusively) in the tropics. "...For these reasons the Teaching Authority of the Church does not forbid that, in conformity with the present state of human sciences and sacred theology, research and discussions, on the part of men experienced in both fields, take place with regard to the doctrine of evolution, in as far as it inquires into the origin of the human body as coming from pre-existent and living matter...."
Landolt, E. Personal communication to J.W. Cross, 4 May 2001. Les, D. H. & D. J. Crawford. 1999. "Landoltia (Lemnaceae), a new genus of duckweeds." Novon 9: 530-533. Les, Donald H., Crawford, Daniel J., Landolt, Elias, Gabel, John D., Kimball, Rebecca T. (2002) "Phylogeny and Systematics of Lemnaceae, the Duckweed Family" Systematic Botany 27: 221-240. Philbrick, C.T. and Les, D.H. (1996) "Evolution of aquatic angiosperm reproductive systems." BioScience 46 (11): 813-826. Rothwell, G.W., Van Atta, M.R., Ballard Jr., H.E. and R.A. Stockey. 2004. "Molecular Phylogenetic Relationships among Lemnaceae and Araceae Using the Chloroplast trnL-trnF Intergenic Spacer." Molecular Phylogenetics and Evolution 30: 378-385. Cabrera, L.I., Salazar, G.A., Chase, M.W., Mayo, S.J., Bogner, J., and P. Dávila. 2008. "Phylogenetic Relationships of Aroids and Duckweeds (Araceae) Inferred From Coding and Noncoding Plastid DNA." American Journal of Botany 95 (9): 1153-1165. Dr. Corner's statement was taken out of context, and in any event was written before the great explosion of bioscience knowledge in the last four decades of the twentieth century: He was writing before the advent of DNA cloning and genomic sequencing, before the discovery of homeobox genes, and before the theory of punctuated evolution. In short, today we benefit from a wealth of factual knowledge unavailable in 1961. No responsible scientist would agree with the above statement today. Is evolution "proven" or is it a theory? Often opponents of evolution play with words to deceive their listeners. A common definition of 'theory' is that used by lawyers, to whom 'theory' is an untested idea. But this is not what evolution means to scientists. To scientists an unproven idea is an 'hypothesis'. Among scientists, 'theory' is reserved for a well-established idea. The evidence supporting evolution is vast, and this fact is recognized by nearly all professional biologists and other scientists who have taken the effort to study it without prejudice. In addition, esteemed religious scholars agree that evolution is a well-established scientific concept. Consider the opinion of the late Pope, John-Paul II, "Today, almost half a century after the publication of the encyclical [of Pope Pius XII, 1950], new knowledge has led to the recognition of the theory of evolution as more than a hypothesis." Araceae. The family of aroids, plants closely related to Lemnaceae. Pistia is an aroid. See the chart above. To learn more [ follow this link ]. Arales. The order of plants that include both aroids and duckweeds. Homeobox gene families are now known in all multicellular organisms from fruit flies to humans and in plants. The first homeobox gene, bithorax, was discovered in the fruit fly, Drosophila melanogaster. Edward Lewis, of the California Institute of Technology shared a Nobel Prize for his pioneering research on homeotic genes in the fruit fly. The first homeobox gene identified in plants was knotted1 which plays a major role in leaf development. Other homeotic genes are known to regulate floral development. Mutations in floral homeotic genes can convert one floral type into another. For example, the agamous mutant of Arabidopsis converts stamens into petals and replaces the fourth whorl carpels with sepals. Sequencing the agamous gene showed that it encodes a DNA transcription factor. Studying floral homeotic genes has led to unexpected insights into how floral organ type is determined.